If you are suffering from pain or injuries, regardless of the specific location, the best way to know what’s going on with your body is to come in for an appointment. 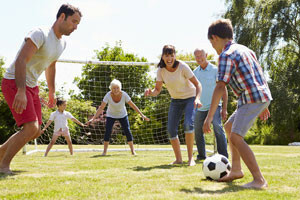 Every body is made up of interconnected parts, so when one area hurts the pain could be stemming from a system of checks and balances caused by a seemingly unrelated area of your body. Jody knows how to get to the root of each individual’s issue(s) using her 20+ years of experience combined with her extensive knowledge of the body and intensive (and ongoing) training. Even if you’ve tried massage before, it’s worth scheduling an appointment with Jody. You’ll recognize the difference in her bodywork. Let Jody help you find relief. Schedule your session by calling (309) 369-6970. Or contact Jody to learn more about how she can help reduce your pain and speed up the healing process. 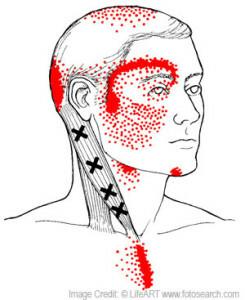 Sternocleidomastoid m., trigger points image credit: © LifeART www.fotosearch.com Stock Photography. LifeART image copyright 2016 Wolters Kluwer Health, Inc.- Lippincott Williams & Wilkins. All rights reserved.